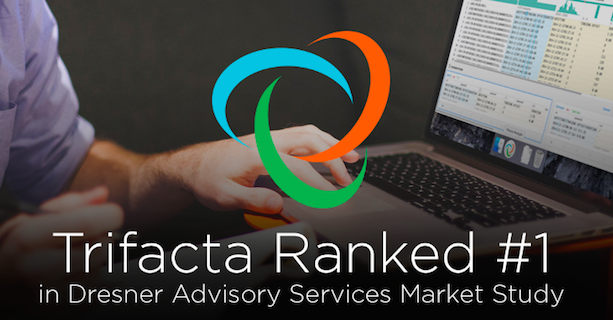 San Francisco, CA – March 1, 2016 – Trifacta, the global leader in data wrangling, today announced it has been named the 2016 top vendor in Dresner Advisory Services’ second annual End User Data Preparation Market Study. This is the second consecutive year that Trifacta has been recognized as the leader in end user data preparation. Download the full 2016 report here. The second edition study, part of the Wisdom of Crowds research series, examines current usage trends of self-service data preparation software that enables end users to effectively model, prepare, and combine data before analysis. The study addresses user perceptions and intentions around data preparation requirements, including usability, integration and manipulation features. 65 percent of respondents “constantly” or “frequently” make use of end user data preparation. More than 80 percent of respondents indicated that the ability to interactively sample data for testing of transformation logic is a “critical” or “important” feature for end user data preparation products. Usability features were considered “critical” or “very important” by over 60 percent of respondents. Top usability features included a visual interface to view and explore in-process data sets, an interactive profile for refining data, and the ability to build and execute data transformation scripts without requiring programming expertise. In 2016, Trifacta has already been named a Delta-V Award winner for the big data platforms category by Enterprise Strategy Group (ESG). Last year, Trifacta was named a 2015 Ventana Research Technology Innovation award winner in the big data category and was also selected as a 2015 Red Herring Top 100 North America Winner, showcasing the company’s momentum in the big data space. Additionally, Trifacta was named to the The Channel Company’s 2015 CRN® Big Data 100, a recognizing companies that bring innovative tools, technologies and services to market. Trifacta, the pioneer in data transformation, significantly enhances the value of an enterprise’s big data by enabling users to easily transform raw, complex data into clean and structured formats for analysis. Leveraging decades of innovative work in human-computer interaction, scalable data management and machine learning, the unique Trifacta technology creates a partnership between user and machine, with each side learning from the other and becoming smarter with experience. Trifacta is backed by Accel Partners, Greylock Partners and Ignition Partners.